This is a project that I have created which features some Terran units and buildings from each Terran organization in the Starcraft Universe. These are fan interpretations on how they supposed to look like in in-game and even lore. If anyone is interested in joining this project, please PM me or write a comment. Some new or updated models sometime required HoTS and LotV dependencies or else your map will get banned or the unit's model will not function properly during gameplay or not display the textures correctly. Also, I don't take requests and you are allowed to make ideas/suggestions. These models can be used in custom maps or mods. Also, with the release of the Nova Covert Ops mission pack by Blizzard, most of my future models will be needing a Nova Covert Ops dependency in the editor. I really waiting for a Umojan Protectorate units, because they are msot advanced Terran organization in Koprulu, so potential here is great. But I really would like to see your ideas of UED units. So I ask, do you have in mind to do so? So, UED is covered by Alleyviper, who has been making UED models for literal ages. Hammer is doing Moebius Corp currently, and when he's done with that, then he's revamping the Kel-Morian Combine units and adding structures, etc. Then he'll make his custom Umojan faction after that, if you want some miscellaneous Umojan models, looking through the custom campaigns is a great way to track custom models down. We've got some from Alleyviper, Supernova and others. If you don't want to spend an eternity looking for stuff, the Umojan skins from the warchest are fully accessible in the editor, I'd recommend using the Covert Ops structures from their warchest as well for the buildings, if you plan on making a campaign, map, et cetera for the faction. I immediately see the issue. Move the textures to the "Assets/Textures" file path right there in the editor, click all the textures then right click and find move. Then move the command center to "Assets/Buildings/Terran/CommandCenter_Shadow" Yes, I reversed the Shadow and Command Center bits, it's so the model is clustered with the other command center models for ease of finding it. Strange, but it still doesn't work properly: https://ibb.co/Db8QVXq. Even after reimporting, importing first textures and second model, still, it doesn't. Update: I tried to import Balius V2 model: created a new map, used LotV (Mod) and Nova Covert Ops dependencies (if I'm right, I used "novacampaign.sc2mod" and Nova Covert Ops (Art Mod)), but still, model is white: https://ibb.co/LQK3nHR. Be absolutely certain that everything falls under ASSETS/etc. Right now everything is under their own file path. Ensure that everything falls under the Assets folder in the importer, you'll know it worked if you see it at the very top in the importer, nice folder that says: "Assets". Textures need to be in Textures yes, but only under Assets. Without being in the Assets file path, SC2 can't find the textures, giving you your problem. Okay, notice how everything is in "Moebius Corps - Command Center/Assets/etc...", you need to remove the Moebius Corps - etc part and only have the Assets/etc... paths. This is just going ridiculous. Well, the file path is now correct, try closing and reopening the map. Look, I've downloaded another model, created a new map, used LotV dependency, but still, my editor can't display textures for some reason. okay, that time you didn't save the map, save that map, close it, reopen it. It'll be fixed. Second update of the custom Moebius Corps Balius, a Viking titan type seen in the Co-op mission Part and Parcel. I added more emissive lights on the missile pods and wings as well as on the nose cone, additional fins on the engines, and updated the texture color scheme. Based on from the data and design schematics gathered from the Archangel-type Viking titan utilized by the Terran Dominion during the Second Great War, the Moebius Foundation and its paramilitary unit the Moebius Corps had their engineers to construct a new model of the Viking titan with new parts and armaments. The result of this created the Balius prototype Archangel viking. Although the prototype version of the Balius was held in a Moebius hybrid facility, which was taken over by Amon's hybrid legion, a Terran Dominion strike force under the command of General Carolina Davis attacked the facility by stealing the Balius prototype and using it to destroy the cybernetic enhanced hybrids. After the Balius prototype was stolen and the Moebius cybernetic hybrid facility was destroyed, the Moebius Corps later retrieved the data of the prototype Balius to create another one. The result of the construction led to the creation of the Balius Mk. II, an advanced, powerful version of the Balius prototype and a combination of the Archangel viking and Balius prototype's design and appearance. It also retains its LB-10 Gatling Minigun and Nemesis Missile Pods as its armanents but more powerful and deadlier compared to its prototype version's weapons. 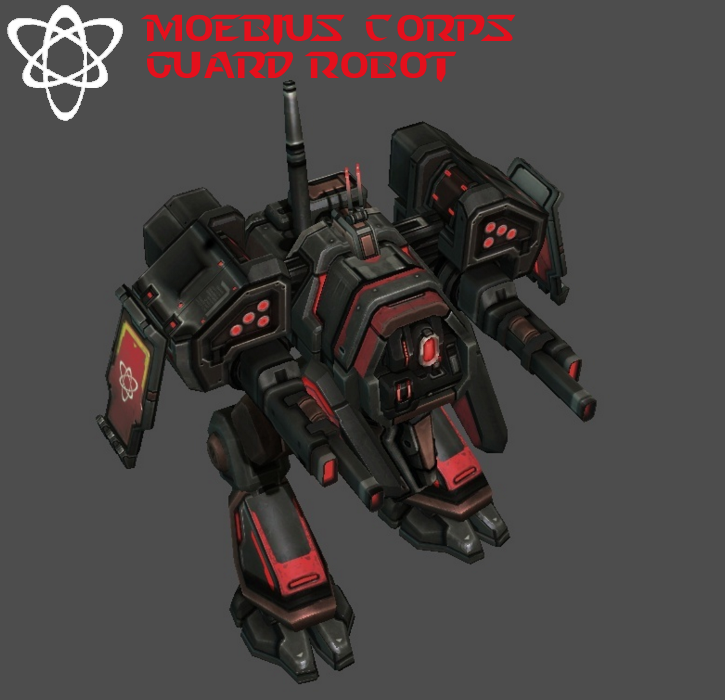 Custom Moebius Corps unit based on the normal terran Goliath unit model by turning it into a robotic one. Guard robots, also called by others as defense robots, are fully automated robotic assault walkers based on the terran goliath deployed by the Moebius Corps forces during the End War. Using the basic frame and design of the Goliath as a basis for its creation, the Moebius engineers created a robotic type head, inspired from the terran cyclone prototypes developed by the Terran Dominion, to place it into the body of a Goliath in order to allow the AI to control it. With the AI successfully installed onto the Goliath body frame, the Moebius engineers rigged the Guard Robot with newly designed gatling guns and missile pods, based on the Balius viking titan prototype's weapons, as its armaments. Most of these robotic walkers are stationed in hybrid research facilities for security purposes and serve as a line of defense against major threats such as rampaging zerg broods and invading protoss forces. They are sometimes seen used as frontline assault walkers to provide support for Moebius Corps marines and other infantry battalions in the battlefield. Cool! I think the warhound shields may have been a tad bit overboard, but other than that great model! Thanks! :-) The shields are just for show and they're intended to show the decals though. Nice! Love your Moebius Corps models! Third update of the Moebius Corps terran faction Warhound model. It is made with new parts for the railgun and missile launcher model from the doodads and Goliath Mercenary unit knee pads in SC2. I added a new shield model on the left side of the Warhound, and some blades on the right side of the Warhound shield, then added them with a glowing particle for a plasma effect on the model inspired from Alleyvipersc2's custom models. 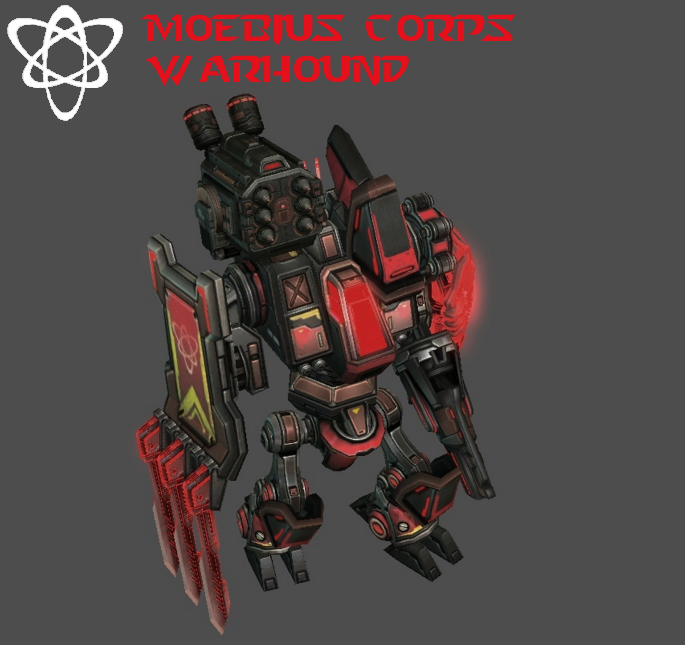 The Moebius Warhounds were employed by the Moebius Corps to deal with armored ground targets in the battlefield. Most of them were modified by the Moebius engineers by giving it a new railgun model with increased generator output to deal against heavy armored targets and a new haywire missile launcher to launch a deadly swarm of missiles against a group of enemies. They are also equipped with a plasma-coated shield, based on from the protoss and Xel'naga plasma shield technology, for extra protection against powerful projectiles, and the other shield was added with attached plasma blades for close-quarters combat to cut through enemy armor. 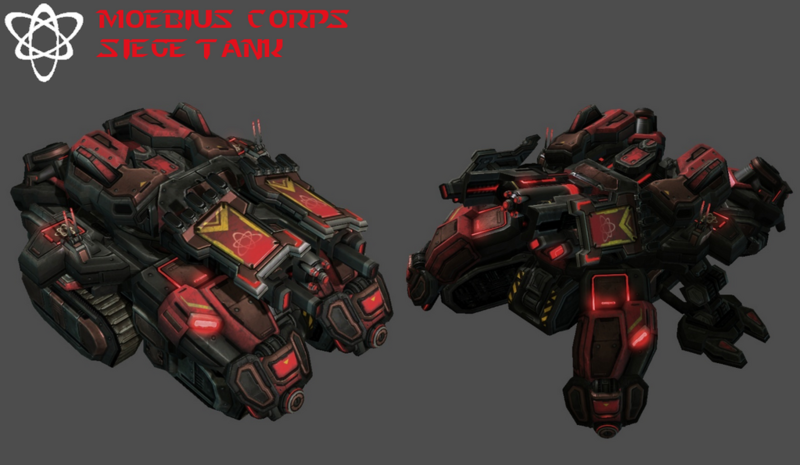 Updated version of the custom Siege Tank model for the Moebius Corps terran faction in SC2 LotV. It is made up with parts from the Balius Viking model for the cannons on the sides, Warhound model parts for the shields on top of the side cannons, antennas on the flap sides, and railgun model for the barrel on the front of the cannon. Notes: Credits goes to SheeldWall for the Brimstone and Alkaline Siege Tank custom models where I use it as a basis for the Moebius Corps Siege Tank as well as its parts. The Siege tanks employed by the Moebius Corps (designated as Siege Tank Mk. II) are Crucio-class siege tanks upgraded by their engineers by adding new cannons for extra firepower to soften up armored targets in tank mode and destroy a group of infantry enemy units in siege mode. The tanks are also added with extra armored platings made of Neosteel for increased durability against heavy armaments such as missiles, punisher grenades and other hard hitting weapons that could destroy the tank, and shrug off gauss rifle bullets. In addition to these featured upgrades, the Moebius Corps engineers installed a new tech, the jump jets, on the siege tank enabling it to climb up and down through cliffs in order to position themselves in a perfect spot for fire-support when attempting to switch in siege mode. The jump jet technology will be utilized later by the Terran Dominion for Nova Terra's Covert Ops Crew's siege tanks during the Defenders of Man Insurgency. 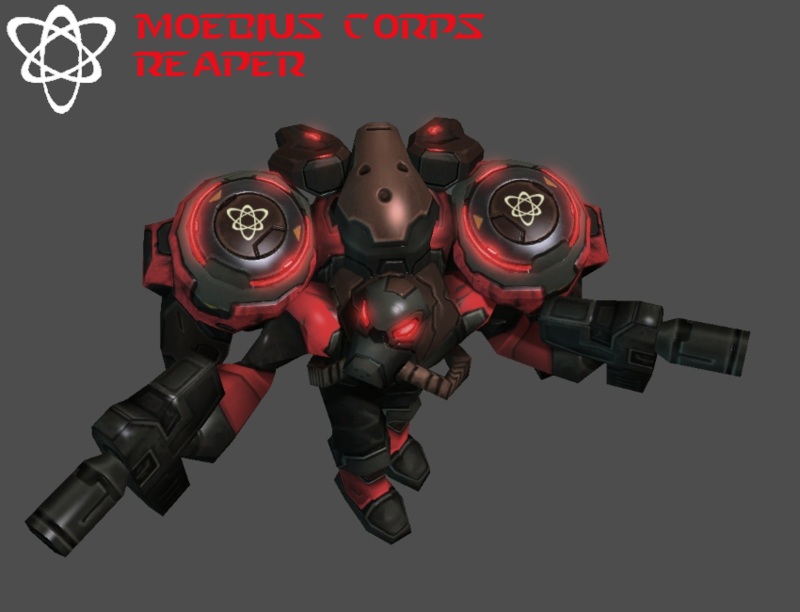 Third update of the custom HERC model for the Moebius Corps faction in SC2 LotV. The HERC is a terran frontline heavy infantry presumably deployed by the Kel-Morian Combine possibly during the last days of he Second Great War and beginning of the End War. Equipped with a welding gun and a grapple line, they are specialized in dealing with waves of lightly armored enemy units in the battlefield, and their armor was made invulnerable to acidic explosions from zerg banelings and volatile infested terrans. They are also employed by other terran factions such as the Umojan Protectorate and Moebius Corps. The Moebius Corps version of the HERC is somehow upgraded by giving it new shoulder-pads and knee-pads for extra durability and equipping it with a plasma-coated shield, based on from the Protoss plasma shield technology, to increase its protection against hard-hitting attacks such as the siege tank's shock cannon fire. 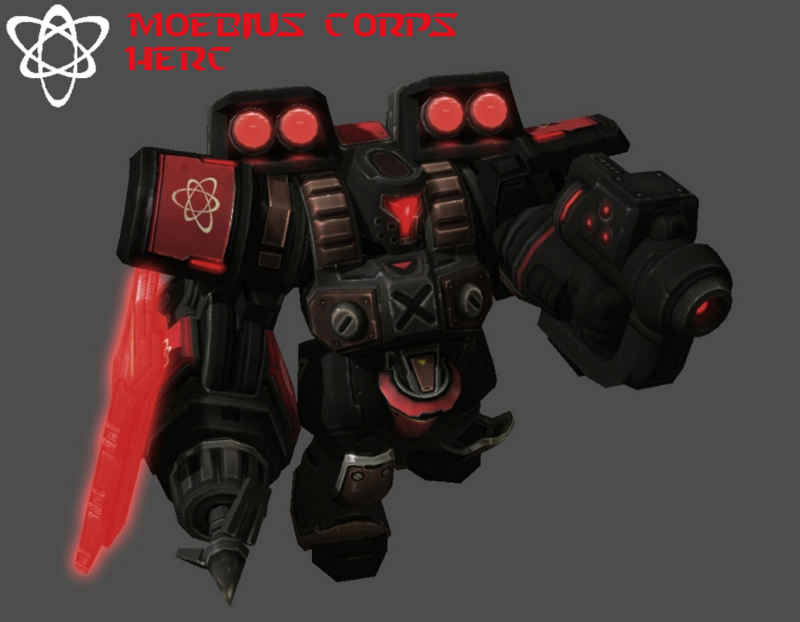 Updated version of the custom Moebius Corps terran Reaper unit for the Moebius Corps faction in SC2 Legacy of the Void. I've used the Umojan Reaper unit skin model from SC2 War Chest season 3 as a basis for retexture. The reapers of the Moebius Corps were formerly part of the Dominion's Reaper Corps who were recruited by or transferred to the Moebius Foundation's research staff in order for them to become part of the Moebius Corps paramilitary group as the Moebius Reaper Corps to protect the Foundation's research facilities from rampaging zerg specimens and protoss prisoners or other situations such as raids from renegade terran groups. But in the advent of the hybrid's awakening, most of the Moebius Corps forces including Moebius Reaper Corps were later mind-controlled by Amon's hybrid legion and they take part in many battles of the End War such as the battle of Korhal where they used their hit-and-run tactics against the forces of the Terran Dominion and Daelaam protoss. Later, the Moebius Reaper Corps took part in breaching the xel'naga temple on Ulnar in hopes to prevent Artanis and Kerrigan from reaching the center of the temple. During combat, the Moebius reapers wore a specialized, advanced suit for better agility and speed when conducting hit-and-run tactics against enemy infantry units and improved jump jets when jumping through cliffs. 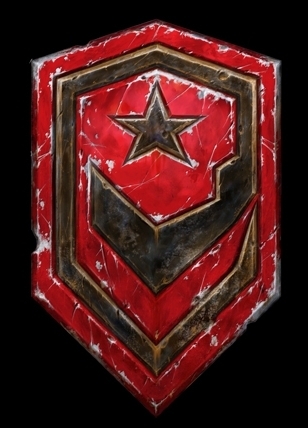 Most of these terran reapers are well-trained and aggressive due to their status as a former Dominion unit and they were able to conduct tenacious strikes and ambushes against their enemies such as throwing cluster bombs into a group of enemies and use their dual pistols for close range and mid range combat. These are all beautiful! Keep up the fantastic work! 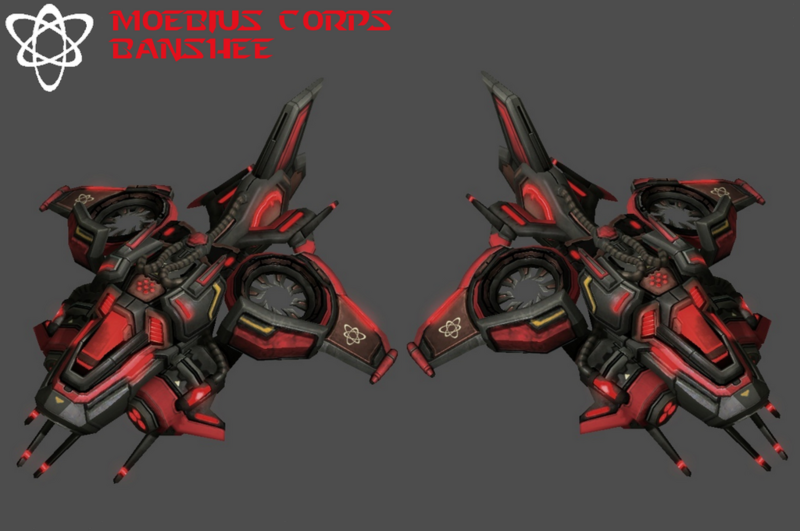 Moebius Corps retexture version of the Terran Strike fighter unit from the StarCraft 2 Co-op missions. 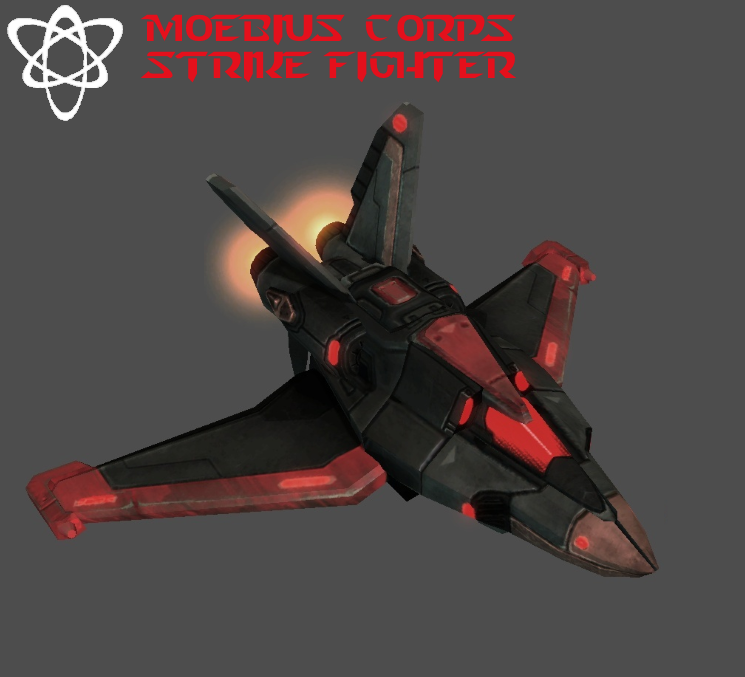 By the time of the End War, the Moebius Corps forces acquired several Strike fighters and filled them up within their ranks to use them as tactical bombers to destroy key targets during major battles. They were deployed in the strike fighter platforms constructed by the Terran Dominion. 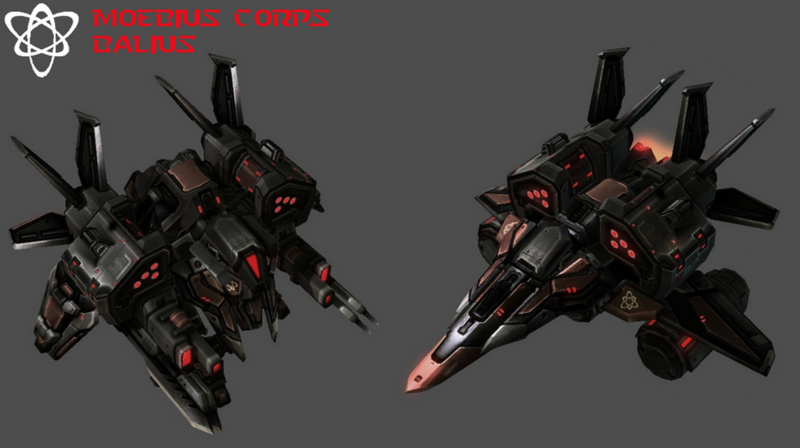 Fourth update of the banshee model for the Moebius Corps faction in SC2. It is made up with combined parts of the Covert Ops and Umojan skins of the Terran Banshee unit model from the SC2 Warchest. By the time of the End War, the Moebius Corps engineers have upgraded the banshee's twin VTOL turbofans, enabling superior stability and performance when paired with the new vertical stabilizer in the rear of the craft. It also receives major upgrades over its Backlash rockets which increases its firepower against armored ground targets and its launchers are now capable of unleashing a barrage of rockets against a swarm of ground enemy units. The design and upgrades introduced was later used by the Dominion engineers to make the covert banshees for the Dominion Special Forces and Nova's Covert Ops Crew after the End War and during the Defenders of Man Insurgency.